Rao Inderjit Singh, the MP from Gurgaon, who in his earlier stint in the Ministry of Defence (MoD) had taken on the Army when it did not accept the indigenously produced Arjun tanks, today returned to the MoD after a gap of five years. Rao today joined as the Minister of State (MoS) for Defence. His work allocation will be decided by Defence Minister Arun Jaitley. Rao Inderjit Singh, who was elected for the fourth time as the MP, is an old hand at the MoD. He was a MoS between 2006 and 2009 in the first term of the Congress-led UPA regime (2004-2009). In 2008, he famously batted for the Arjun tanks when the Army had rejected the DRDO product. Rao was not made a minister in the second term of the UPA (2009-2014) and he openly questioned land deals in Gurgaon benefiting Robert Vadra. He quit the Congress and joined the BJP and was re-elected as the MP from Gurgaon. It was due to his efforts a total of 124 Arjun tanks were ordered and delivered to the Army. However, by then, Rao Inderjit Singh, was not in the ministry to see this. Now, as he takes over, the next version of the Arjun tanks is being developed. It may need another push from this former international-level shooter. He secured a bronze in the Commonwealth Shooting Championship. A security guard at the Indian Air Force (IAF) station in Mumbai’s Khar (East) area shot two of his colleagues and injured two others with his official weapon today, the police said. 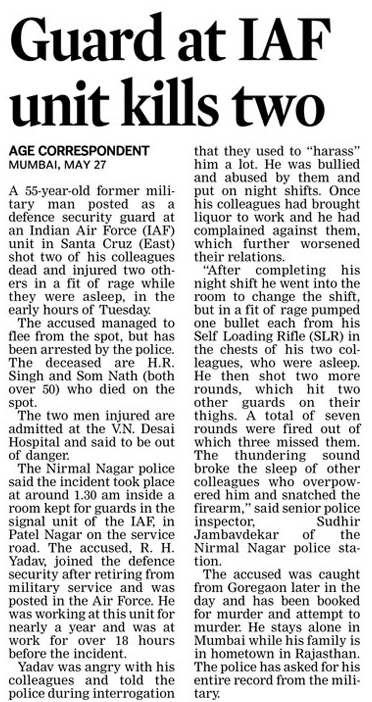 The Nirmal Nagar police said the incident happened around 1 am when RS Yadav, employed as a constable with the Defence Security Corps, who was on duty at the IAF station opened fire from his service weapon at his immediate boss and other colleagues. Police officials told this reporter later in the day that Yadav was upset at not being granted leave. Those dead have been identified as Som Datta and HK Singh. The condition of another guard was critical, while a fourth man suffered injuries in the leg. The two injured have been admitted to the KEM Hospital, the police said. While other guards on duty snatched Yadav’s weapon, the accused fled the premises. The authorities at the station raised the alarm and the police set up roadblocks around the area. A police team on patrol identified Yadav with his uniform and arrested him from the suburban Goregaon. The Narendra Modi government has started functioning, but speculation on the composition have not stopped. A statement by Arun Jaitley that a full-time Defence Minister would be named in a couple of weeks has now started conjectures on who will make it to the strategically crucial ministry. Among the leaders with the stature to occupy the chair, Shourie is the only person who is on the right side of the age (75 years) set by the RSS as the eligibility criteria for a ministerial berth. He is 72 while Joshi (80) and Sinha (76) have crossed the age limit. At 79, former Himachal Pradesh CM Shanta Kumar is also way off the mark. After the surprise entry of Nirmala Sitharaman and Prakash Javadekar-who were almost written off after they failed to make the cut either for a Rajya Sabha or a Lok Sabha ticket-many “left out” leaders may have a reason to feel optimistic. Apparently, the RSS wanted those who worked hard for the party over the years to be rewarded. “Even if they did not contest, they worked hard and stood by the party when it was down and out,” a RSS functionary said. Six out of the 24 Cabinet ministers are women. As External Affairs Minister, Sushma Swaraj is a part of the powerful Cabinet Committee on Security (CCS)-the natio’'s top decision-making body on national security-making her the first woman in three decades (since Indira Gandhi in 1984) to be part of this elite group. Sumitra Mahajan—the longest serving woman MP—appears slated for the post of the Speaker of the Lok Sabha. BJP leader Arun Jaitley today took over as new Defence Minister, albeit with a rider that he could be in the ministry for “only for couple of weeks”, indicating that there is a Cabinet reshuffle on the cards in the near future for a new incumbent at South Block. At the Ministry of Defence, Jaitely first put to rest any fears that may been generated within the Army after BJP leaders Gen VK Singh (retd) and Subramaminum Swamy raised questions over the appointment of Lt Gen Dalbir Singh Suhag as the next Army Chief. Jaitley told reporters: “I believe there should be no controversy or no issue about the appointment of any person. 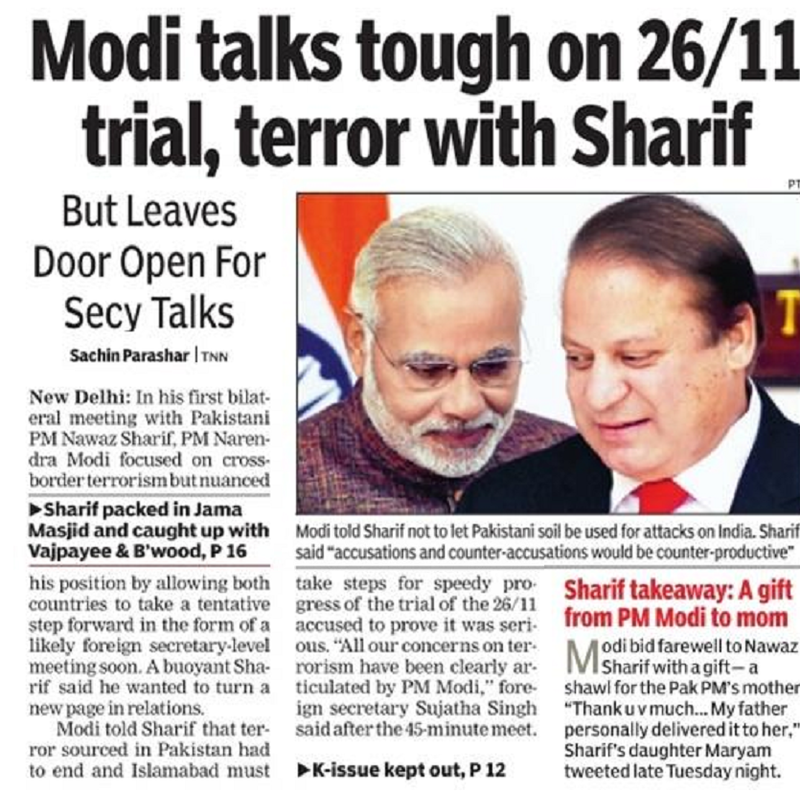 Some comments may have been made but this is not to reflect on the person concerned (Lt Gen Suhag) in any manner”. Jaitley, sources said, laid out a roadmap and told officials that the acquisition process had to be accelerated but within the purview of the set procedures and established rules. He went on the describe the roadmap saying, “We are certainly concerned with the fact that over the last few years some of the areas had slowed down and expediting them would be the top priority.” Jaitley avoided commenting if the new government would increase the present cap of 26 per cent on defence spending. The new minister was first briefed by Defence Secretary RK Mathur, Defence Production Secretary GC Pati, Ex-Servicemen Welfare Secretary Sangita Gairola and Scientific Advisor to Defence Minister and DRDO chief Dr Avinash Chander. This was followed by a meeting with the three Service Chiefs, General Bikram Singh, Admiral Robin Dhowan and Air Chief Marshall Arup Raha. With a budget of Rs 2,24,000 crore for this fiscal ending March 31, 2015, the Ministry of Defence accounts for 12.70 per cent of all government spending – the highest in terms of share of the Budget. In the past, the respective Prime Ministers have held additional charge of Defence, this is the first time that a Finance Minister has been given the Defence portfolio as an additional charge. In the morning when he took over as Finance Minister he said, “For a transient phase, I will be looking after Ministry of Defence also, but that’s only an additional charge till there’s an expansion in the Cabinet itself”. Finance Minister Arun Jaitley, who has been handed additional charge of the important Defence portfolio in the Narendra Modi government, said on Tuesday that he expects a full-time Defence Minister to be named in a "couple of weeks." 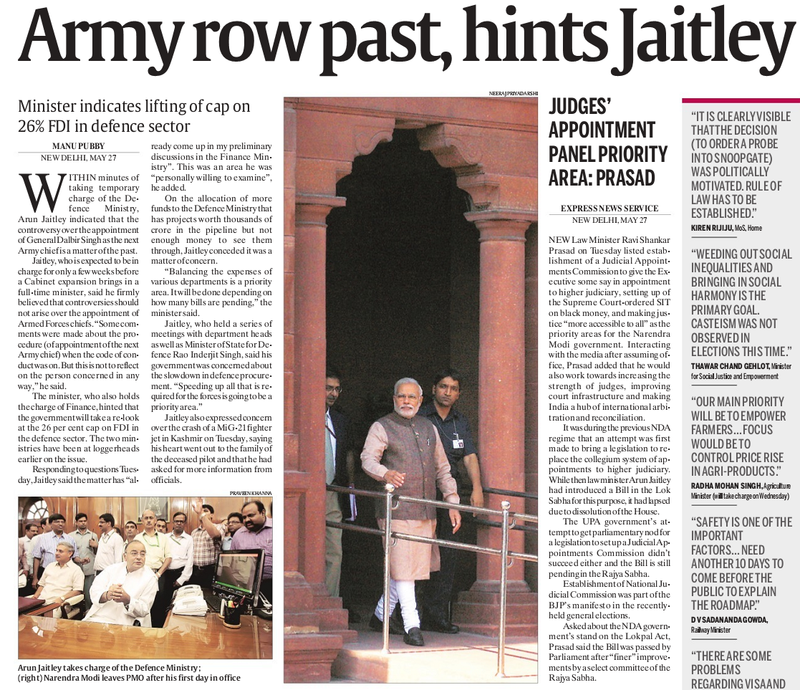 Till then, Mr Jaitley said, he would spend a "reasonable amount of time" at the Defence ministry. The Manmohan Singh government had two weeks ago announced that Lt General Dalbir Singh Suhag will be the next Army chief. Mr Jaitley had written in a blog post then that the decision not to leave the announcement for the next government displayed "a high degree of arrogance even in defeat." Then too Mr Jaitley had qualified his criticism by saying that "the BJP does not wish to bring the newly appointed Army chief into any controversy." New Delhi, May 27 (IANS) Speeding up procurement of defence equipment and indigenisation are among the top priorities, said Arun Jaitley soon after taking charge as defence minister Tuesday. He said there should be no controversy over the appointment of the new Indian Army chief though his Bharatiya Janata Party had opposed the outgoing government's decision on this days before leaving office. 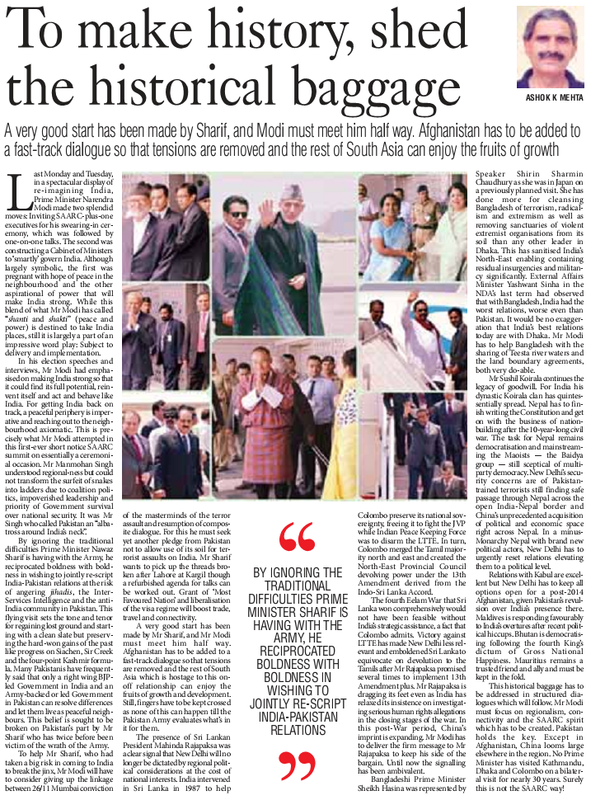 "Security of India is a matter of prime importance. It is about external security of the country and preparedness of armed forces... speeding up (procurement) of equipment required for support is the priority area," Jaitley said. "We are concerned that in the last few years some areas have slowed down. Expediting them is a concern," he said. On indegenisation of defence equipment, the minister said: "It is an issue, both limbs of which are dealt by my departments. It is already coming up in discussions." He added it was an area he was "personally willing to oversee". On the issue of Lt.Gen. Dalbir Singh Suhag becoming the new army chief, Jaitley said there should be no controversy. "I believe there should be no controversy about the appointment of any person," he told reporters. Lt. Gen. Suhag was named the successor to army chief Gen. Bikram Singh by the Congress-led United Progressive Alliance (UPA) government days before it left office. The BJP then objected to the new army chief being named, saying there was no hurry and that the decision should be left to the new government. "There were some comments on the procedure which happened when the model code of conduct was there. This should not reflect on person concerned in any manner," added Jaitley shortly after he assumed office as the new defence minister, an additional charge he has with the finance ministry. 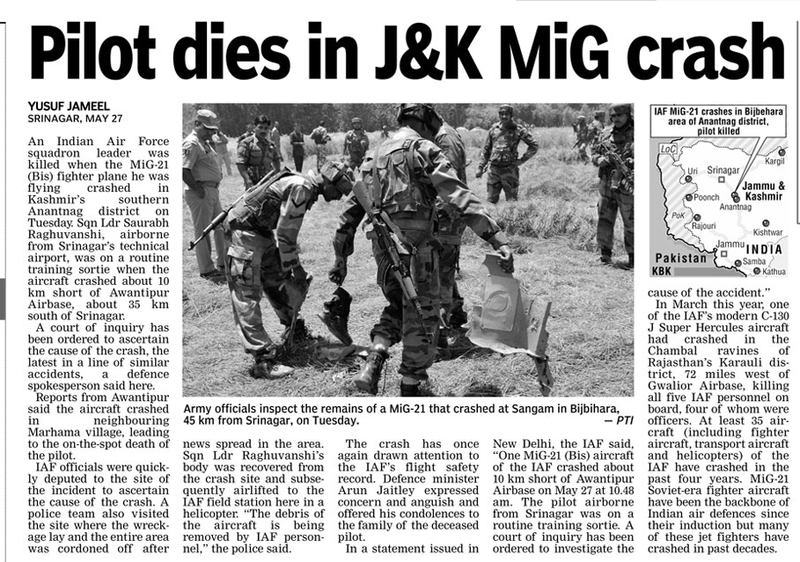 Jaitley, who met the three Service chiefs, also expressed concern over the crash of a MiG-21 aircraft in Jammu and Kashmir earlier in the morning. "It is a matter of great concern. 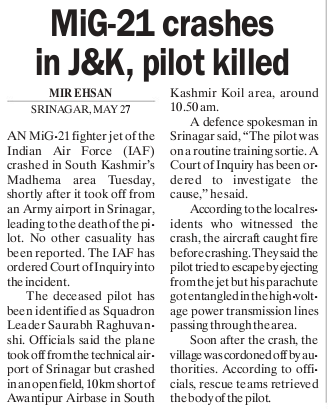 My heart goes out to the pilot who lost his life," he said. Jaitley, who also took over as the finance minister, however, said the charge of defence ministry was additional for him and a new minister would take over in "two weeks" and for now he would try to do a "balancing act". "I will be spending reasonable amount of time here (defence ministry) to clear the backlog, and all new decisions that need to be taken. 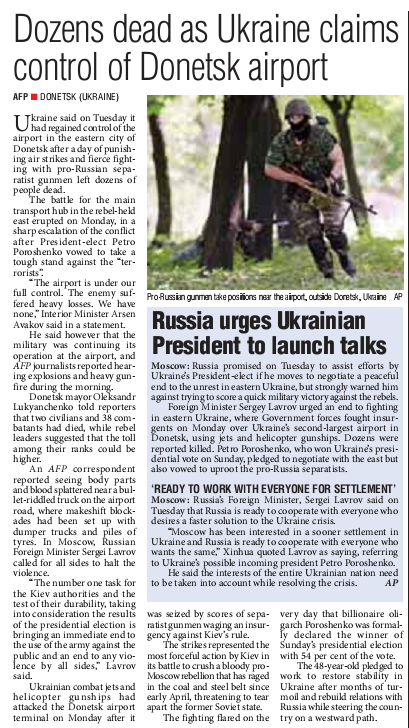 It is a very important ministry, hope it gets a full time head in next two weeks," he said. NEW DELHI: Defence minister Arun Jaitley said on Tuesday there should be no controversy over the appointment of the new Indian Army chief, even as the BJP had opposed the outgoing government's decision on this days before leaving office. "I believe there should be no controversy about the appointment of any person," Jaitley told reporters when asked about Lt. Gen. Dalbir Singh Suhag being named the successor of the Army chief, Gen. Bikram Singh. 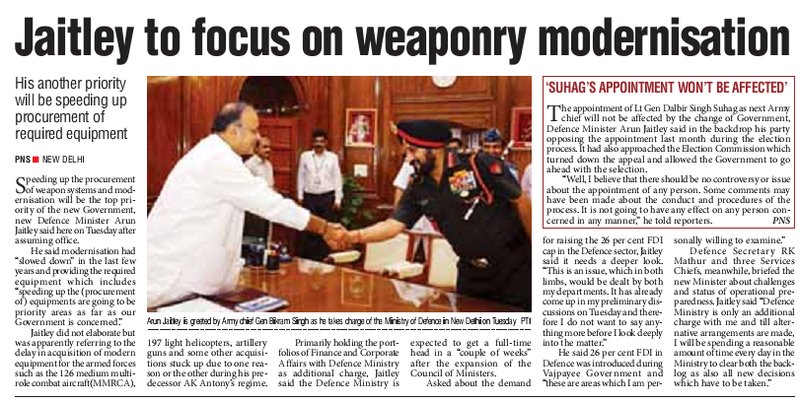 The Congress-led government took the decision to name Lt. Gen. Suhag the new army chief days before it left office. This was after the Election Commission gave its nod to making the announcement. The Bharatiya Janata Party (BJP) had objected to the new army chief being named, saying there was no hurry and that the decision should be left to the new government. The former army chief, Gen. V.K. Singh, had imposed a disciplinary ban on Lt. Gen. Suhag for a blotched intelligence operation in Assam. Gen. Bikram Singh lifted the ban soon after he took over in May 2012. Gen VK Singh is a minister of state in the newly sworn-in National Democratic Alliance (NDA) government.